Are you a coffee gourmet? If you love a really good cup of java, you will probably like the world’s most expensive coffee – it is unique! In Indonesia, ‘Kopi’ is the word for coffee, and ‘Luwak’ is the local name for a small carnivore called an Asian Palm Civet. Civets are in the same family as the Mongoose (Viverridae), and are found only in southeast Asia. Although they are carnivores, Palm Civets also eat a lot of fruit. They’re especially fond of the bright red cherries (beans) of the coffee plant. The beans pass through the Civet’s digestive tract whole, after fermenting in their stomach. The animal then defecates the beans. I cannot imagine the thought process of the first person to look at defecated coffee beans and decide ‘Hmm, I bet these would make a good drink’. (But then I can’t imagine what the first person to milk a cow was thinking either). The nocturnal Civets eat only the ripest and sweetest berries, so coffee farmers would often find the best of their crop missing in the morning. The animals were hunted as pests, and featured often on the dinner menu. Small coffee farmers often survive at a subsistence level, where every penny earned can make a difference in their lives. Hoping to salvage their crop, the farmers began picking up the defecated coffee beans. They discovered the resulting brew had a unique flavor and aroma, without a bitter taste. In contrast to the earlier hunting of the Civets as pests, the animals are now working for the company. They are either caged and fed coffee cherries, or allowed to roam the coffee plantation inside a boundary. The beans take about a day and a half to pass through the animal. Then they are gathered by hand. After a wash in a forest stream, the beans are dried in the sun before being sold to a company that roasts and exports the coffee beans. Kopi Luwak is the world’s rarest and most expensive coffee. In the Philippines, only 500 kg are produced each year, and once roasted, sells for $115US per kilogram. In our crowded world, conservation only works if the wildlife has a value to man. 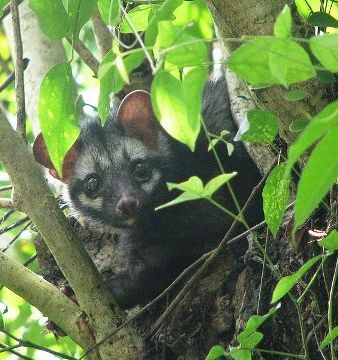 With the rapidly increasing number of gourmet coffee drinkers around the world, I suspect the future of the Asian Palm Civet is pretty secure. If you’re the adventurous type, Kopi Luwak Arabica coffee is available from various US websites, ranging in price from $190.00 to $350.00 per pound. If anyone has tried this unique coffee, let us know what it was like in the comments below. We would love to give it a try, but at those prices, it’s going to have to be a gift from someone!